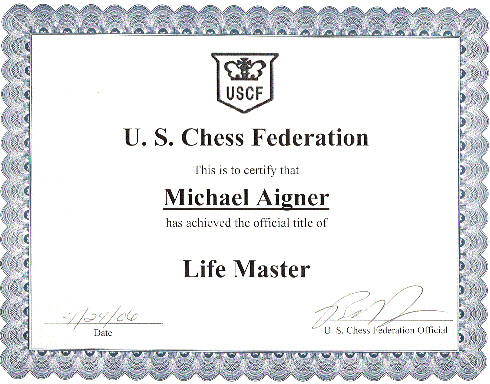 Michael "fpawn" Aigner earned the USCF titles of National Master and Life Master while playing at many top level the over-the-board chess tournaments in California, Nevada and across the country. I finished 2nd at the 2006 US Open in Chicago, thereby qualifying for the 2007 US Championship in Oklahoma. Over the years, I also shared my knowledge with dozens of young students, mostly through online lessons. I enjoy the challenge of coaching older (4th to 12th grade) and intermediate to advanced juniors (rated 1000 to 2000+). Some of my students are nationally ranked for their age group and a few have won State, National, and even World Championships! View my Honor Roll. A number of these juniors attained the rank of master themselves before graduating from High School! A lucky few even earned international titles. I strongly believe the best way to improve is by practice and learning from the inevitable mistakes. One of my lessons may take the form of a game between teacher and student, with takebacks allowed and much discussion. While a solid grasp of chess theory is useful, you only become a better player if you can properly apply your knowledge and experience in the competitive environment of a tournament. Click here for my Ten Goals for Chess Lessons. People inquire whether I teach opening theory. It depends on the particular student. In general, I prefer to dedicate time to all three phases of the game: opening, middlegame and endgame. Indeed, I consider the endgame to be a simplified middlegame and a laboratory for developing skills needed throughout a chess game. After hours of playing endgames against me, it comes as little surprise that my students are very resourceful during this important phase. 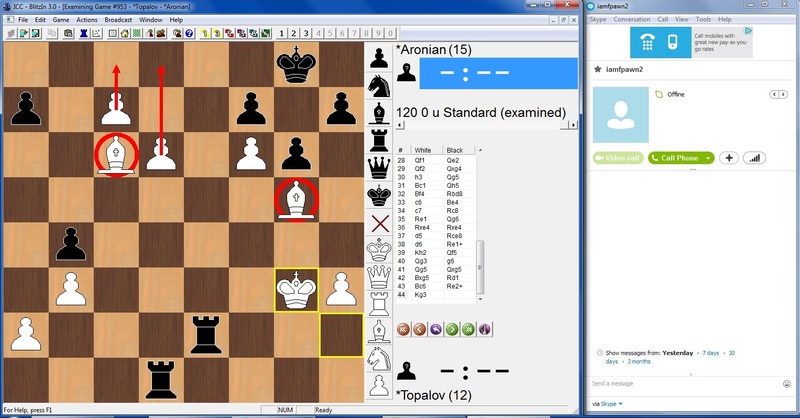 I teach chess lessons on the Internet Chess Club (ICC) using what is called "examine mode". The teacher and student both look at a board and analyze through moves, both what was actually played and alternative variations. Teacher and student communicate using Skype, a free internet voice software. For added emphasis, the teacher can use arrows and circles on the ICC board, much in the same way that a sports coach would diagram a play. ICC membership and knowledge of the basic functions (or the ability to learn quickly) are mandatory. For ICC software, I recommend that Windows users download either Dasher (easier to use) or BlitzIn (more advanced) and Mac users download Lantern (Java required). After years of experience, I believe online lessons with a voice connection are about 90% as worthwhile as a face-to-face class. On one hand, a few students (young children) may benefit from more face-to-face interaction. On the other hand, the online connection eliminates all of the transportation logistics. Think you can beat a master? In addition to formal lessons, I may be available to play training games with brief post-mortem analysis. I recommend this option for students with a minimum rating of 1600. Juniors rated over 2000 should contact me to set up a free sparring match (blitz or rapid). Students who live in Davis or nearby (e.g. the Sacramento region) may wish to meet in-person. Please contact me directly to discuss the necessary logistics. Unfortunately, I do not travel out of town to teach. However, I do enjoy interacting with students at tournaments that I attend, mostly in California and Nevada. Depending on the round schedule, I may find time to review some games. Don't be shy! Check out my standard Lesson Fees. Payments may be submitted online by Paypal or by mailing a check at the end of each month. For more information, please contact me at michaelNOSPAM@fpawn.com (remove NOSPAM from address) or online at ICC under the username �fpawn�. If you are unsatisfied with my performance, please let me know so that I can try to improve. Within one week of paying, you may request a refund of your last lesson. Note that a refund will terminate our teaching relationship. Prospective chess students should email me Answers To These Questions. Thank you!